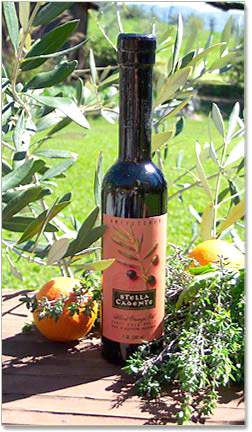 Stella Cadente Blood Orange Olive Oil - Following the great success of the Meyer lemon olive oil, Stella Cadente decided to spend time perfecting their newest addition, Blood Orange olive oil. This unique blood orange oil has wonderfully rich orange spicy notes with a light peppery finish. Made from late harvest Mission olives & organic blood oranges pressed together, this oil is a perfect accompaniment to duck dishes, red snapper, & as a lift to fresh summer green salads. Stella Cadente Blood Orange Olive Oil.